Below: Picture of the Lunar Eclipse of December 10, 2011 at fullness from Berkeley, Ca. 4:15 am PST, setting up camera to take pictures of the eclipse. First, I'm cooling the camera down so it does not dew-up when I head out into the cold conditions. I have a hand-held automatic camera, which will make high quality lunar images elusive to capture. After chilling the camera, I'm going to shoot some test images from a range of settings to dial in the camera for optimal settings. By then I hope to have the range of settings to get some good pictures of the eclipse. I chased eclipses for a few years, and I've got a great image of an annular full solar eclipse somewhere on negatives... I'll dig them out and digitize them sometime. Image results: better than I expected. The ground haze obscurd the reillumination of the Moon. The Eclipsed Moon plunged into the deep mists which rendered the horizon invisible. Bright full moon prior to the Full Eclipse of Dec, 2011 illuminates the mositure in the air. Below: Too Late! Full Eclipse taking charge of Moon's appearance: Burnt Red and Blinding White fight for control of time and space...myth, mystery, and ritual fall before science. Below: And then nature eats "science," and its inbred intellectual assumptions for lunch. Fiercely bright sunlight narrowing its hold on the Lunar Surface. I think of HG Wells' First Men in the Moon. I recommend it highly. Below: Image of the last sliver of sunlight around limb of the Moon, Full Lunar Eclipse of December 2011. 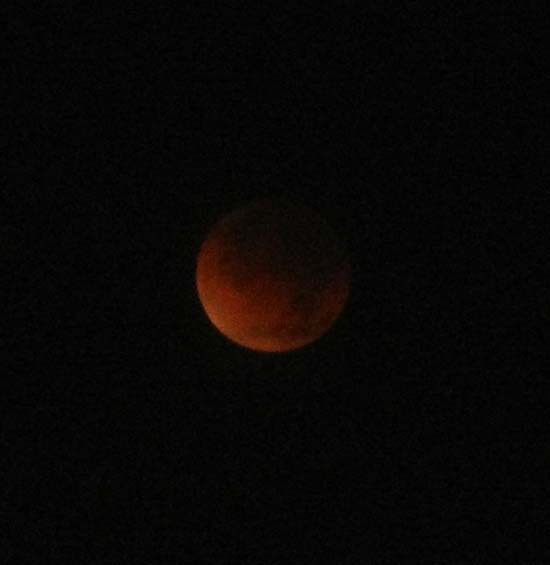 Below: Rich burnt red colors reach maximum intensity as the Full Eclipse of the Moon reaches fullness, December 10, 2011. Below: Dark Burnt Red Moon during Full Lunar Eclipse of December 10, 2011. I shot these with a Cannon A2000 IS set to manual. I ran the ISO and shutter speeds at a variety of settings to capture the changing light of the darkening Moon. If you have some images of the Full Eclipse of the Moon of December 10, 2011 register so you can post them up.